Summary: Revelation 13 discusses two beasts: the beast from the sea and the beast from the earth. These beasts will have great authority at the end of time and use their power to enforce the Beast's mark. 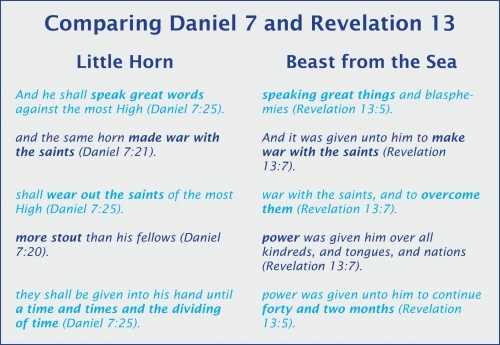 The first beast of Revelation 13 has seven heads and ten horns—and the same attributes as the little horn of Daniel 7. …And he causeth all, both small and great, rich and poor, free and bond, to receive a mark in their right hand, or in their foreheads (Revelation 13:1,8,11-12,16). This passage describes two beasts that will dominate world events at the end of time. The first arises out of the sea, and the second out of the earth. The second beast causes all that dwell upon the earth to worship the first beast, and in so doing they receive the mark of the Beast. Again, by applying the Biblical definitions to the symbols employed in this great prophecy, we can unravel its mysteries. The core symbols are beasts, heads, horns, sea, dragon, and earth. A beast represents a king or a kingdom according to Daniel 7:17. The two beasts of Revelation 13 thus represent two kingdoms or political powers that dominate world events in the last days. The first beast arose out of the sea. Revelation 17:15 tells us that the sea represents “peoples, and multitudes, and nations, and tongues.” Therefore the first beast arose from nations (inhabited territory). In contrast, the second beast arises out of the earth, which represents the opposite of nations, multitudes, and kingdoms. Therefore, the second beast must arise in areas of the world where nations, multitudes, and kings were not established (uninhabited territory). The first of the two beasts of Revelation 13 is the same power as the terrible fourth beast in Daniel 7. And I stood upon the sand of the sea, and saw a beast rise up out of the sea, having seven heads and ten horns, and upon his horns ten crowns, and upon his heads the name of blasphemy. And the beast which I saw was like unto a leopard, and his feet were as the feet of a bear, and his mouth as the mouth of a lion: and the dragon gave him his power, and his seat, and great authority (Revelation 13:1-2). 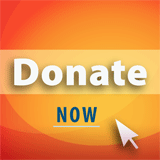 The first beast in this passage has ten horns, just like the terrible fourth beast in Daniel 7. Both of these beasts represent Rome, as shown in the chart below. Read more about the 42 months in Revelation 13:5. 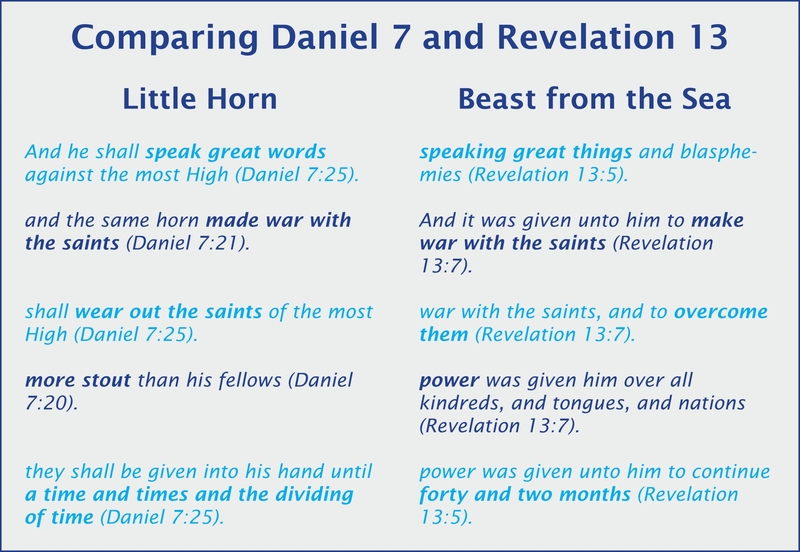 As we compare the two prophecies, we see that the first beast of Revelation 13 and the little horn of Daniel 7 are one and the same, both representing papal Rome.